This appeal is made by UK Uncut. In two weeks, George Osborne, the man in charge of Britain’s sinking economy, will present his government’s third austerity budget. In it, he will set out a continuation of the cuts that have decimated Britain’s public services and put up to 6.3m people out of work. George will tell us that ‘there is no alternative’ to his slash-and-burn economics; that austerity is the only route to recovery. But even George can’t have failed to notice one thing – austerity isn’t working. Whilst George attempts to get us to focus on Britain’s rosy relationship with the ratings agencies, he knows a million 16-24 year olds are out of work. As he bangs on about low borrowing costs, Britain’s female unemployment rate has hit a 25 year high. Austerity may be working for the bond markets and the banks, but it isn’t working for Britain. This Budget Day, don’t let George get away with it. 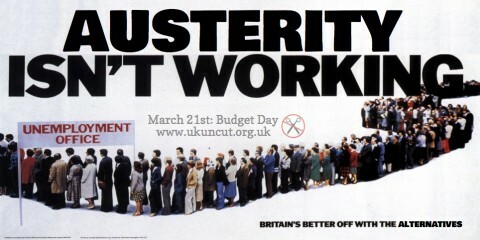 Whether you’re unemployed or fortunate enough to still be in a job, join UK Uncut’s Austerity Isn’t Working Queue outside Downing St at 11am on Wednesday 21st March. By recreating of one of the most iconic images in British political history, together we can make sure the photos in the papers aren’t of George’s smug face, but of a scene that demonstrates the human cost of the government’s failed austerity policies. The queue will only go ahead if 630 people sign up to this Facebook event by the evening before the Budget – that’s one person for every ten thousand Britons seeking full time work. Start spreading the word at your local Jobcentre and beyond. On March 21st, be outside Downing St at 11am. Join the queue that will wipe the smirk off of George’s face and demand an economy that bails out people instead of banks. Austerity isn’t just unfair and unnecessary – it isn’t working. Britain’s better off with the alternatives. See you at Downing St.
Posted in: Economy, Macroeconomics, Public Spending.